Anyone living on the West Coast and desert regions of the United States is familiar with the concept of water scarcity. As global warming, food and commodity production, and population increases continue to affect the planet and its resources, water scarcity will continue to be an important and critical issue. 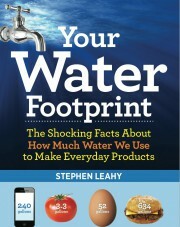 Environmental journalist Leahy has created a guide for understanding just how much water is used in our daily activities and in the manufacturing of the products we consume, while putting into context current facts about the status of water availability. Readers will find the information, which is presented in an ­infographiclike style, easy to understand and to act upon. While the introduction and conclusion expertly unpack the complex issue of water use, the images and large text in the body of the book seem to be geared toward younger readers. However, this book is unique in its handling of a complex topic and is unlike other texts on the subject. Readers interested in a more traditional study on water might choose David Sedlak’s Water 4.0. This entry was posted in energy, environment, food, Water and tagged clothes, electricity, Energy, Flood, fresh water supply, hidden water, Stephen Leahy, virtual water, Water, water expert, water footprint, water scarcity, water shortage, what you can do by Stephen. Bookmark the permalink.